Cross over Interstate 94 on Broadway, heading west, and you move from Northeast Minneapolis to North Minneapolis. One of the first things you see along the street is Charles Caldwell’s massive mural ornamenting one side of the 4th Street Saloon. It features a portrait of Billie Holiday, an iconic rendering of this quintessential jazz vocalist. I believe it may be one of the greatest images ever made of a person in the rapturous moment of creation. When I saw it glowing in the morning sun today, I had to pull over and record it. Thank you Charles, William, and Billie. 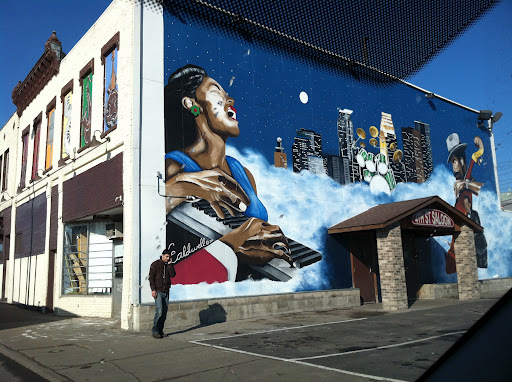 For more information about muralist Charles Caldwell, a longtime resident of North Minneapolis, please see the profile here. For the 2005 New York Times obituary for Gottlieb, see it here on the photographer’s web site.